This is a BIG DEAL! First, contestants need to be members of WPJA, and getting in to WPJA is NOT easy! WPJA screens applicants; less than 5% of wedding photographers qualify for membership. Plus, the quality of images that are entered into competition is topnotch. 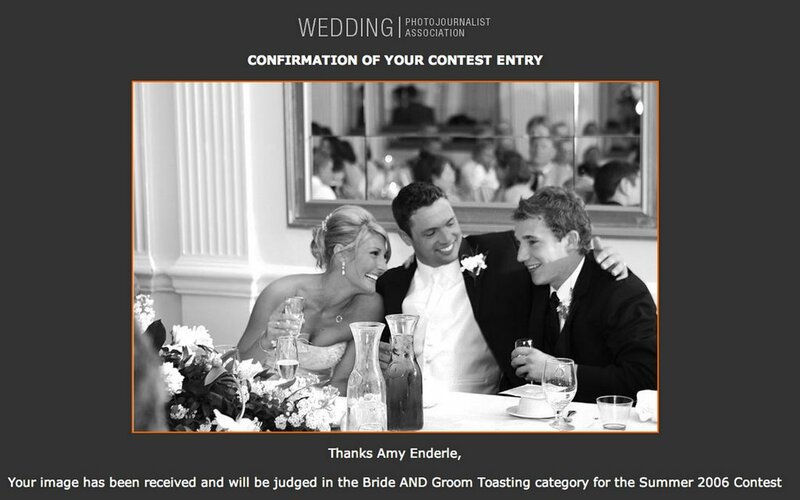 Amy and I visit WPJA’s website frequently for inspiration, and now one of Amy’s images is out there inspiring others! (2) Click on any category under "See the Latest Contest Winners" to bring up the pop-up window with the "Summer 2006 Contest Gallery"
(3) Select the category “bride & groom toasting” and click "next" 'til you reach her image. Note that two of the top 3 winners in this category were from Sweden; others in the top 10 were from the Eastern US & Pacific coast states: California, Washington, North Carolina, Virginia, New Jersey. Thanks for representing the midwest and getting Missouri on the list, Amy!